Nothing like a little casual Monday to kick the week off right. Admittedly, I've been hunting around for the right set of day-time appropriate pajamas for the past couple of months and I think this Clover Canyon set certainly does the trick. How about you guys? Will you be giving pajama dressing a whirl this spring? wow!! our outfit is fabulous!!! those are pajamas!??! would never have guessed it! If I found a pair like those, I just might. They look fantastic! you look great in anything - pajamas confirm it! I am completely obsessed with this look! You look amazing, I don't know if I could pull this off. But you definitely! I love it! This is such a fun outfit! 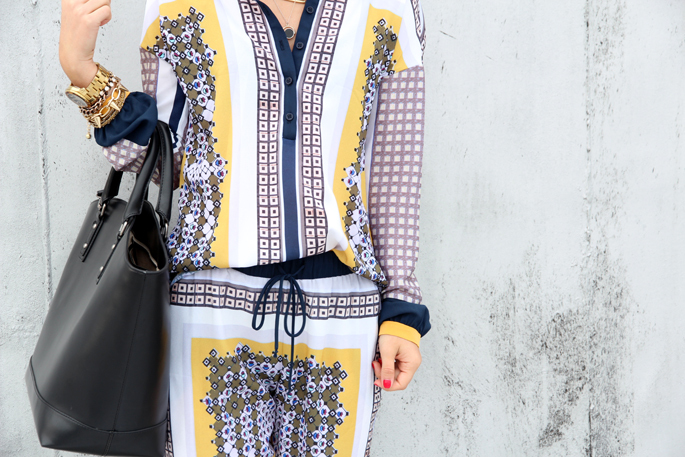 So lovely print and as result a great outfit!!! Such a fan of those Zara heels! Really nice outfit! And so comfy! Love the print, the print is very afghan like! So chic and comfy! Looks so silky and easy to wear, love it! You pull off that scarf print so perfectly! Wow, that is bold. You are full of glamour and guts. Great work. You are too cute for words, m'dear! Gorgeous look!! Love the pattern of the pants and shirt! this is STUNNING i am in love with the whole look! I don't think I'm brave enough for the PJ look. But you are rocking it! I really love this! You look amazing! cool outfit :) I love the colors. I am not sure if I can pull it off, but you totally can! What a fun and comfy way to start the week! I love it! Im not sure if the PJ trend is for me, but you sure are making it look fabulous! Wow, you totally rocked this look successfully! I love the night to day pj look! cute look! I don't think i can pull this off because i have to wear scrubs on a regular basis...but it looks good on you! I would love to rock this trend! I love your particular set of PJs! Does this make it okay to wear slippers out of the house also? Just kidding! Ive had it in my mind that I wanted to find the perfect wide leg pajama pant but these are sooo cute! You have such an amazing style and its so achievable, I love it! And you really rock that short hair, it looks amazingggg! J'adore! So chic and beautiful, very right for this season! This is soooo cool! Great look! love this the print is awesome. I've been eyeing those pants myself, I just don't know if they'll fit! i ADORE this print! would totally rock this not-so-pajama look! Amazing I really did want to try the pajama trend but I didn't think I'd find ones that would look good but now that I saw yours I'm more inspired to hunt around and look for some pajamas! check out my blog and follow me! Love this look! The print is great! love this look. funky, cute, and looks downright comfortable!! I'm loving your hair and wondering how I can get those effortlessly sheik waves? Maybe a future post? Hair how to's? You totally rock this look! I could never.